A clean desk policy creates a secure business atmosphere and a positive company image. The definition of a policy is "any course of action followed primarily because it is expedient or advantages in a material sense". When a company institutes a policy that promotes clean desks, overall it affects staff and employees across the board in a positive way. At the conclusion of the workday, employees are expected to straighten their desks and put away any office-related paperwork. Papers should be filed in the appropriate cabinet or filing drawer. Sensitive material should be placed in a locked file. This policy will not be implemented in a heavy-handed manner, but employees are expected to adhere to the spirit of the policy. Notice there is some flexibility in the sample policy. When a policy is first adopted to encourage clean desks, it may be viewed as an extra burden in an already busy office, especially to those who work with layers of clutter and paper on their desk. 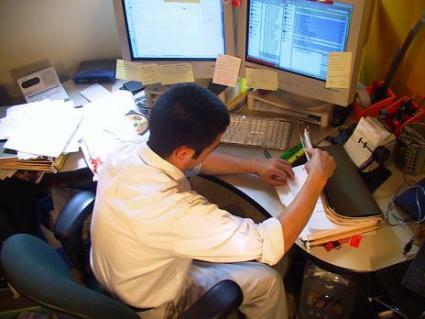 The mindset of many of these individuals is that their messy desk doesn't affect anyone but them, but studies show that people with a messy desk waste 15 percent of their time looking for things. It reduces the chance of confidential information being compromised or passwords being stolen. Employee stress is lessened when an employee's desk is clean. The occurrence of workplace accidents and spills drops when a policy supporting clean desks is enforced. Overall, the perception of a clean desk is one of efficiency and a well organized office. Another benefit of following clean desk guidelines is that it helps reduce the amount of paper used and along with that the amount of toner used in printers and copiers. Why? Because employees can find what they're looking for which eliminates the need to print off additional copies.A clean desk also helps others find necessary documents if an employee is off sick or on vacation. This eliminates wasted time even when the employee isn't at work. Set aside a planned time each day to clear paperwork from your desk. Paperwork builds up just like junk mail at home when you don't deal with it daily. Don't keep papers you don't need. Strive to handle papers as few times if possible. If you're cleaning your desk, file papers in the proper file or into the trash bin. Shred any papers of a sensitive nature. Don't print emails to read them. All it does is turn into clutter. Deal with cleaning your desk before you leave for the day so that you start the next workday with a clean desk and documents in their proper place. Scan documents when possible and store them on your computer using paper filing software. This eliminates paper filing and makes documents easier to find no matter who is looking for them. The primary reason for a clean desk policy is that it creates a positive company image when customers visit your place of business. It also reduces the likelihood that sensitive or confidential materials can be compromised. Like any policy, a policy to encourage clean desks only works if it is enforced. Management will have to come to an agreement as to disciplinary action necessary if the policy is not adhered to and balance their approach with flexibility. One last thing to mention is that if you except the policy to work, employees will need to have time in their day to deal with clearing paperwork from their desk. If you think this may be an issue, it is best to build a plan to make the time into your policy.